(TORONTO, ON – JUNE 30, 2016) Toyota Canada’s reputation for promoting advanced, efficient motoring received global recognition over the weekend, at the first-ever Nîmes-Alès eco-rally in southern France. There, Toyota’s Canadian rally team – Vinh Pham and Alan Ockwell – piloted their 2016 Toyota Prius to a first-place finish in the Hybrid category and a second-place Overall result. The Nîmes-Alès eco-rally was created to promote advanced technologies in southern France. Pham and Ockwell are a seasoned rally team. They’ve worked together since the 2008 Targa Newfoundland rally. They have won the Canadian round of the Alternative Energy Cup in 2012 in a Prius Plug-In. Their performance in Montréal’s Rallye Vert and an impressive finish at a 2013 Monte Carlo rally, encouraged the Nîmes-Alès eco-rally to invite them as international competitors. 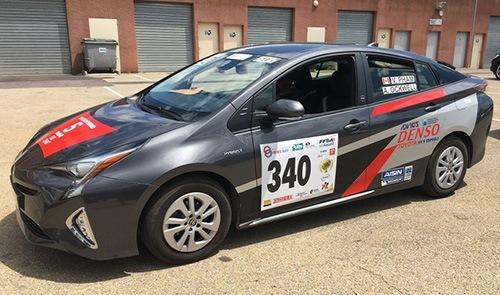 For the inaugural Nîmes-Alès eco-rally, Toyota Europe and Toyota France partnered to provide the Canadian team with a 2016 Prius – the fourth-generation of Toyota’s iconic hybrid vehicle. The new Prius is one of the first models built on the Toyota New Global Architecture platform. It features a redesigned exterior for a more striking silhouette… a new, high-tech interior employing soft-touch materials and a wrap-around design… and lively, fun to drive handling. The rally took place over three days (June 24-26), in the mountainous terrain around Nîmes and Alès. Teams were required to drive more than 300 kilometers, including a 30-minute track-endurance stage during which an average speed of 65 km/h had to be maintained. 48 teams took part in the eco-rally, including 16 teams driving Toyota hybrid models. The Pham-Ockwell Prius achieved an impressive overall rally fuel efficiency of just 4.2L/100 km – actually beating the model’s official Canadian fuel efficiency rating of 4.5L/100 km (city/highway combined). While steep grades took their toll on power reserves, the drivers credit the Prius’ regenerative braking system for fully recharging the hybrid system’s batteries on the downhill portions of the route. They add that even more power was saved while waiting in line for stage starts, because the hybrid’s engine shuts off when the car is stopped, yet is instantly ready to provide confident acceleration when needed. Since the first FIA Alternative Energy Cup – a world championship series for hybrids and other alternatives to conventional vehicles – was awarded in 2007, Toyota has won the Hybrid class (Category VII) in six of nine years.